We are going to catch up on a couple of Forces Of Destiny figures. Let’s start with Luke Skywalker & Yoda. It’s better than you think it is. Learn more in our Research Droids Reviews today! Be sure to leave your thoughts in our comments section, vote in the poll or even comment about it on our Facebook page. Click the banner below for the direct link to the review! As always, you can also send your review requests via email if you’d like to see something that we didn’t cover yet. ← 50% Off All TRU Exclusive Star Wars Animatronics! 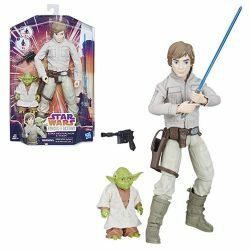 You can pre-order the Luke Skywalker (with Yoda) Forces of Destiny from Entertainment Earth with a February release.